These men make up the 2014 GOP Texas lieutenant governor candidates: Land Commissioner Jerry Patterson, Sen. Dan Patrick, Agricultural Commissioner Todd Staples and Lt. Gov. David Dewhurst. 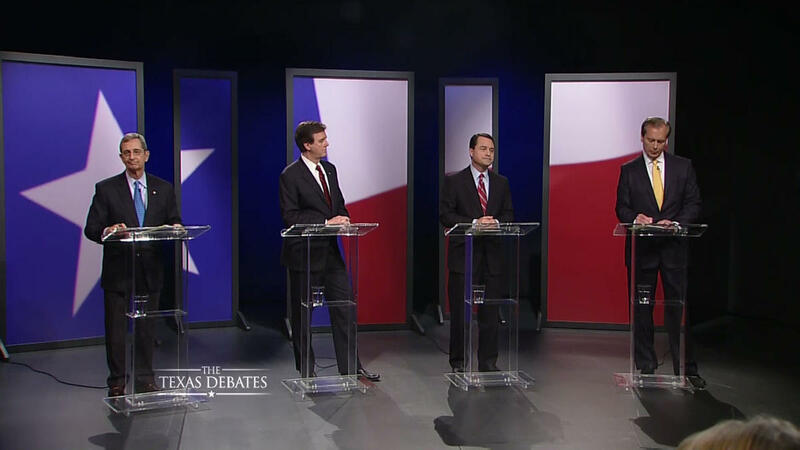 Tensions mount as the candidates campaign for the March 4, 2014 primary that will determine who goes on to face the Democratic nominee (Leticia Van de Putte). They share a party, they share a love for red and blue ties, but most importantly, for the purposes of this assignment, they all agree that creationism should be taught in public schools. In recent debates, all four candidates have made their stances very clear. They have each stated that the Supreme Court’s ruling to omit creationism from curriculum in public education is wrong and they all pledge to take action against the decision if elected. The belief that matter, the various forms of life, and the world were created by God out of nothing. Biblical creationists believe that the story told in Genesis of God’s six-day creation of the universe and all living things is literally correct. Scientific creationists believe that a creator made all that exists, though they may not hold that the Genesis story is a literal history of that creation. Creationism became the object of renewed interest among conservative religious groups following the wide dissemination of the theory of biological evolution, first systematically propounded by Charles Darwin in On the Origin of Species (1859). In the early 20th century some U.S. states banned the teaching of evolution, leading to the Scopes Trial. In the late 20th century many creationists advocated a view known as intelligent design, which was essentially a scientifically modern version of the argument from design for the existence of God as set forth in the late 18th century by the Anglican clergyman William Paley. Over 60 years after the Scopes Trial, the US Supreme Court ruled that a Louisiana state law requiring that creation science or creationism be taught in public schools alongside evolution was unconstitutional because it sought to advance a particular religion. The government’s action must not result in an “excessive entanglement” of the government and religion. In 2005 the US District Court for the Middle District of Pennsylvania once again applied the Lemon Test to find that the teaching of intelligent design was a similar violation of constitutional law as had been previously stated in Edwards v. Aguillard. The court found that neither intelligent design nor creationism met the standard qualifications for scientific theories. Is another Supreme Court case pitting religious views against secular education on the horizon?